A gay pride parade in Jerusalem sounds preposterous: the same city that is the capital to three world religions and a millennia-long touchstone of strife and violence. 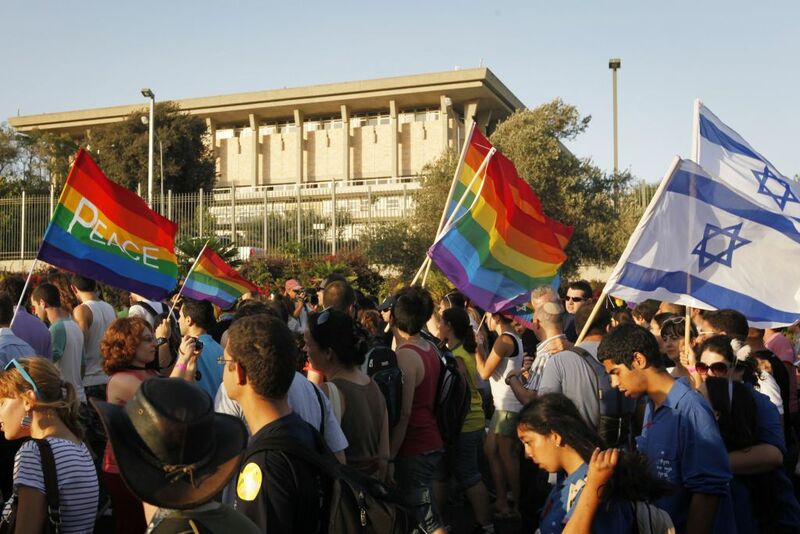 Even those who are aware of Tel Aviv's internationally known gay culture, which attracted a record quarter-million marchers to its own pride parade in June, would scarcely consider venturing out in their colorful tanktops to march down Ben Yehuda Street in Jerusalem. And yet, this summer saw exactly that: a record twenty-five thousand Israelis of all stripes emerging onto the streets of the Holy City with rainbow flags and painted faces, marching proudly and resolutely for what was billed as the "Jerusalem March For Pride and Tolerance." Coming one year after a stabbing attack that killed Shira Banki, a 16 year-old straight ally who marched in support of her LGBT friends before being murdered by a fanatic ultra-Orthodox Jew, it was a sobering yet empowering moment in a community where LGBT individuals have long scratched out an existence by keeping a low profile. In this environment, it's worth taking a moment to recognize an unlikely supporter of Jerusalem Pride: Israeli Prime Minister Benjamin Netanyahu. In two versions of a video posted to Facebook before the march, one in English and the other in Hebrew -- the latter of which is particularly notable -- Netanyahu clearly positioned himself as a vocal supporter, endorsing the sentiment of the marchers and slamming critics who painted their efforts in a negative light. "Sadly, some elements of our society are still not yet ready to accept the LGBT community," he said. "My solemn promise to you today is to continue fostering respect for all of Israel's citizens, without exception." It isn't the first time Netanyahu has used his podium to speak on the subject. In fact, he's released several statements and videos in the past few months, including a stirring speech in the aftermath of the Pulse nightclub terror attack last month, where he called on citizens to "comfort and stand together" with the LGBT community. Likud, the ruling right-wing Israeli political party that Netanyahu leads, also welcomed its first openly gay Member of Knesset (MK) this year, Amir Ohana, and the Likud LGBT forum that Ohana now leads had a robust representation at Tel Aviv's recent pride parade. Netanyahu's public addresses on the subject are "unlikely" because he is the leader of the most right-wing coalition government in Israel's history, consisting of other parties that are infamous for their homophobia and ultra-nationalism. Israeli LGBT activists will also be quick to point out that Netanyahu and his own party, as recently as this past spring, blocked six separate gay rights bills, and reneged on promises to increase the funding of LGBT organizations in the aftermath of the Jerusalem attack until activists threatened to cancel Tel Aviv's Pride parade in protest. Given what many would see as this glaring hypocrisy, one would think that it would be far more politically expedient for the Prime Minister to remain silent on LGBT issues, or issue vague statements that perform the high-wire walk of avoiding specific mention of the LGBT individuals in an anti-gay terror attack, like many GOP leaders did in the aftermath of Pulse. One of the best barometers of the LGBT community's rising influence is their shifting perception among historically hostile actors. In the United States, leaders of the Republican Party have been attempting - with embarrassingly little success thus far - to convince their base that a realignment is needed. In the Republican National Committee's now infamous "autopsy report," compiled by party elders after Mitt Romney's loss in 2012, they said: "We need to campaign among...gay Americans and demonstrate we care about them, too." As recently as a few weeks ago, Senator Marco Rubio warned his party of the costs of gay intolerance. Put another way, the LGBT community has become too important of a political constituency to ignore. As the leader of another country with an empowered LGBT electorate, Netanyahu has always been a keen observer and manipulator of both domestic and international constituencies. These skills have allowed him to claim, for better or worse, the title as one of Israel's longest serving Prime Ministers, second only to its first, David Ben Gurion. This political awareness of the rising influence of both Israel and the world's LGBT community is just as important as the reality that both face common enemies in the radical Islam of ISIS, Hamas, and Iran. So: Benjamin Netanyahu, LGBT ally? Not quite. As the GOP so helpfully stated in their autopsy report, "It is not just tone that counts. Policy always matters." To that end, there's a lot more that Netanyahu can and should be doing with organizations like The Agudah, Israel's equivalent to the Human Rights Campaign, to move his government past rhetoric in the direction of concrete steps that will improve the everyday lives of the LGBT community - such as banning conversion therapy of minors and passing civil unions. Some can even be done independent of the complex coalition politics in Israel that often hold up votes on controversial legislation, like increased funding for LGBT issues. But it's not often that we see foreign heads of state so explicitly courting the LGBT community, underscoring the importance for them to live full, healthy and thriving lives. Rarer still to see it from the leader of a tenuous right-wing coalition of ultra-religious parties. And for a country in the Middle East? Well, it's the only one by a long shot.